Porterhouse started life as a brewpub in Dublin back in 1996, and since then have added more bars in Ireland, and have expanded overseas with bars in London and even New York. All their beer is still brewed in Dublin, and they describe themselves as “Ireland’s largest independent Irish Brewery”. This is their Celebration Stout, a 7% ABV Imperial Irish Stout. 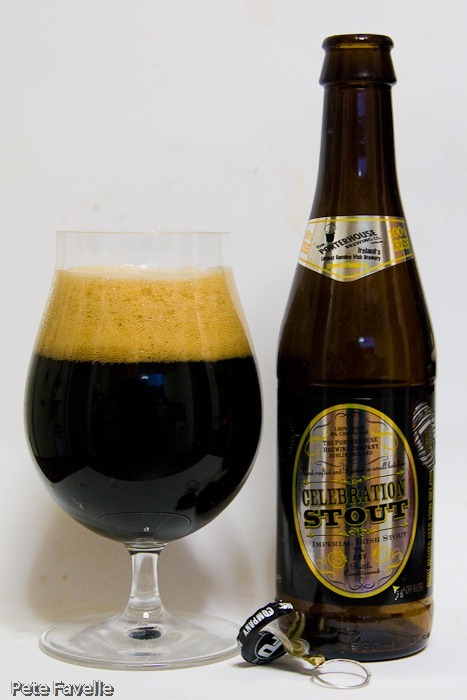 It’s almost perfectly black in the glass, with a deep, rich and creamy looking tan foam on top. The aroma is full of sweet molasses, black treacle and alcohol-soaked dried fruit – if anything, I’m surprised that it’s only 7% as the nose suggests an even bigger beer. In the mouth, the sweetness is still there at the start, but it quickly surrenders to a properly deep, dry bitterness. The alcohol isn’t very obvious in the mouth, but warms your throat as is slips down. There’s still rich dried fruit in the background, and it has an impressively big body but that dryness stops it all from becoming overwhelming and just keeps you going back for another sip. I also just have to point out that ring-pull style bottle top. It might seem like a small thing, but I think it’s brilliant, and I wish more beers had them! The nice folk at Porterhouse gave me this bottle to try when I visited Ireland earlier this year with Bord Bia.